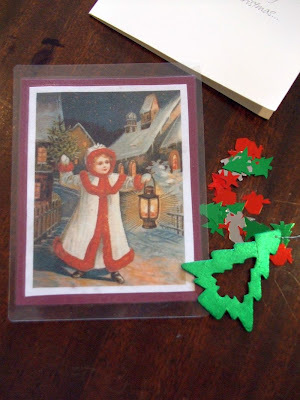 On the Sixth Day of Christmas Martha in Canada gave to me . . . 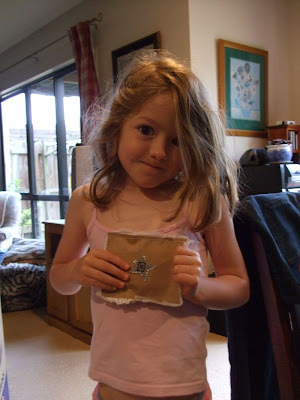 Honesty the wrapping of these swap gifts is just incredible. And this is The Princess, chief present opener. I wonder if I will be allowed to open my very own gifts on Christmas morning . . . 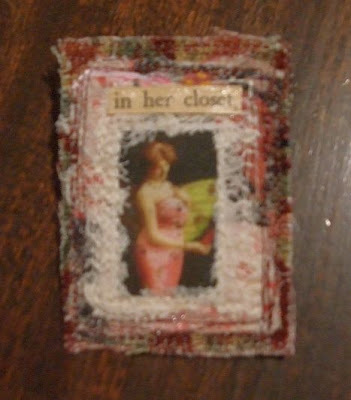 Clever Martha, this is a brooch, layers of fabric, a printed image and slogan 'in her closet' which have all been stitched together, she must have a good machine! She has then cut it so the raw edge gives a slightly frayed effect. Fabulous!!!! 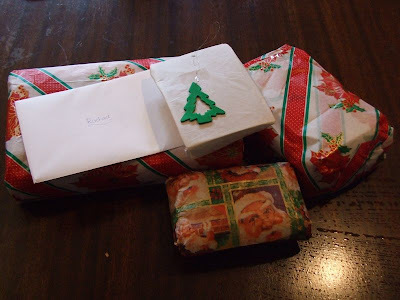 The day just kept getting better, the courier arrived with my Deck the Halls swap parcel from Deb in Australia. 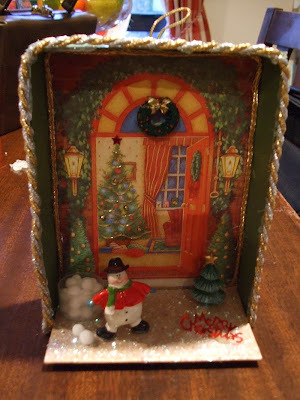 Deck the Halls was to be one handmade ornament and one store bought ornament. More than two packages here! 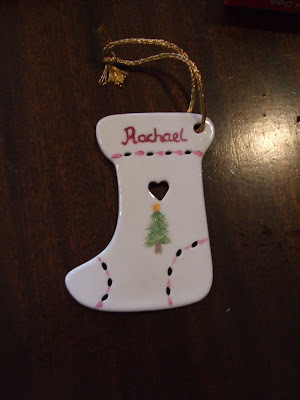 First of all this fabulous ceramic stocking that Deb handed painted. The Princess can't make off with that, its got MY NAME on it! 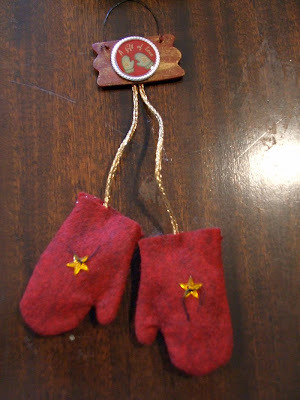 Then these cute as, hand stitched mittens hanging off a little wooden hanger. Gorgeous!!!!! I love this, a 3 dimensional collage, lovely details, The Princess loves this, we are 'sharing' it!!!!! Can you see the snow man with his bucket of snow balls, cute, cute, cute. The store bought ornaments, more gorgeous-ness. I haven't seen these in our stores which makes them even more special. 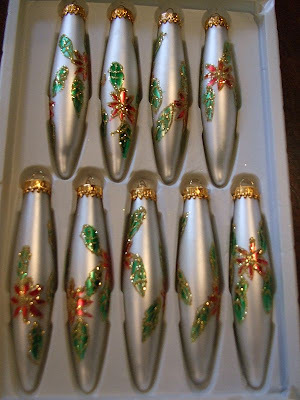 I have the perfect tree to hang these on, shoosh, little secret (vintage white tinsel tree, bought on online auction!) Hope it arrives tomorrow. And there's even more, this cute laminated card, so sweet. Thanks Deb, for ALL the gifts, The Princess and I love each one. 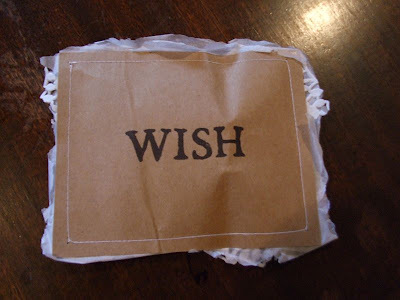 In one of my wrapping, got to get to the Post Office frenzies, I forgot to take photos of all my Christmas swap efforts, apart from the crap banner for the 12 Days swap!! How's your luck??? I was really happy with what I made Deb and I found her the most fabulous thrift store bought decorations that I had to steer Mum away from. Deb doesn't have a blog, I think she is getting one though, so I can't direct you to her for a photo of what I sent. Also liked the stocking I made for Analise and I had so much fun filling it. Analise hasn't got hers yet, yes I was late! Liked the garland I made Penny also. Penny has hers but is the midst of ice storms and power cuts and can't post the photos. 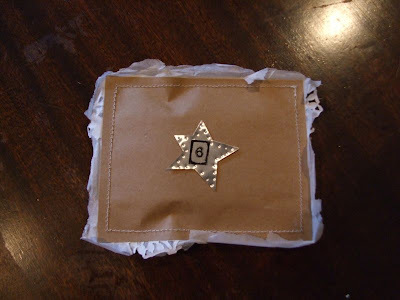 I'm off to make a new stocking for The Princess.